This is a really beautiful song. If I start with that, it makes me feel like everything I write from here on in will just be superfluous gumpf. Despite that, I'm gonna go on with it. Is that ok with you? Is it ok with me? I think so. Because, as I always say, good music deserves kind words. So if I go into raptures, that's ok. Think of it as a star-rating system, but with the quality of the words being the guiding light. Stars and numbers... that's for the NME and other things. Who needs words when you can just listen to a song and, instead of respecting the effort that goes into it, just say, "Mmmmyeah it's an 8/10, stick it up on the site, print it – NEXT!" Not my style. Anyway. Sorry about that. 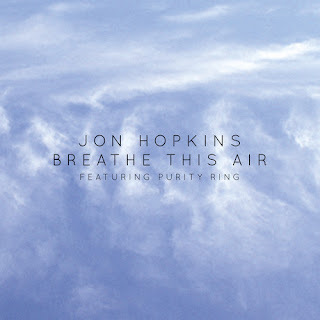 Today we have Mr Jon Hopkins, a London-based producer, doing a song with pretty-vocal'd chill-step duo Purity Ring called 'Breathe This Air'. (I made up chill-step, but that just goes to show how silly genres are). Hopkins, on his Facebook, describes it as "A new version of Breathe This Air with vocals by Purity Ring" - the original is a much bassier, dancier affair. In the Purity Ring version, it's condensed, prettied up, ambientised and generally blooms in wonderful clouds of sound around your ears - it's a less abrasive sound, I guess. Let us listen. Isn't it lovely? There are some lovely details at the beginning that really catch the ear. That gentle tinkling piano, the atmospheric noises of endless space, the reversed and spliced samples of the vocal that comes in quite soon, and - a small detail, but an important one for me - the skiffle of the snare drum at 0:29, a great live-drums-sounding technique that pops up throughout the song. The drums themselves are nice: glitchy, catchy, lovely. What Jon Hopkins seems to do is hold things back, giving you a lot of good sounding things but keeping stuff for later - like the lightly crunched modulated synth that hops in after about 1:25. It's this progressive sound that keeps your ears quite excited for what will come later. Brief synth glitches jut in like arrows from heaven. The vocals from Purity Ring - the female half of the duo, obviously - are just perfect. They're treated carefully, like a rare bird; people always say that to hold a bird, it's a careful balance of not-too-much and not-too-little. This is just how these vocals are laid on the track, not over-produced, yet glittering with a seemingly unending reverb, touched with a little electronic autotune for stylistic purposes (or at least that's what I hear). As for the vocals themselves - what a voice. Beautiful. It's hypnotic. This comes as a single from Jon Hopkins' 4th album, Immunity, out on Domino records. You can download it digitally on 23rd September.